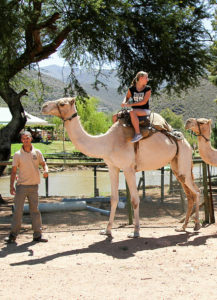 From the wonder of the Cango Caves at the foot of the formidable Swartberg mountains and the Rust en Vrede Waterfall to beautiful old sandstone buildings and of course Ostrich Show Farms, Oudtshoorn has numerous attractions to keep you entertained. 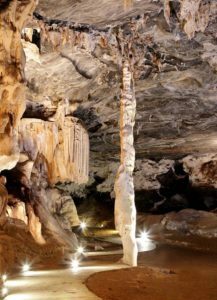 You will find the finest dripstone caverns, with their vast halls and towering formations. Prior reservations recommended from October through February. Excellent activities for children featuring Go-karts, camel rides, putt-putt, petting zoo, donkey-cart rides, bumper boats, etc. Spend time with Steven Evans who will introduce you the local birds. Various half / full-day tours available. 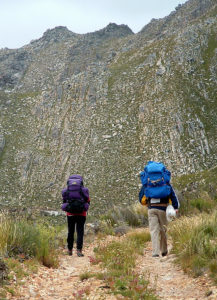 There are a variety of hiking trails around the Swartberg & Oudtshoorn. Hikes range from 20 minutes to 2-4 days, so there is something for everyone. A breeding facility focused primarily on endangered species. 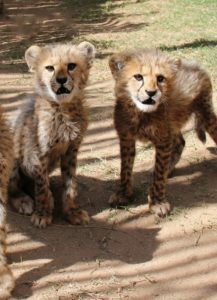 Visitors have the opportunity of interacting with hand-reared cheetahs and getting actively involved in saving this species and others from extinction. Note: this is definitely NOT a typical zoo! A lovely boutique wine-farm 13km north of Oudtshoorn in Schoemanshoek. Excellent wine/beer tasting and a lunch of “Karoo Tapas” (selection of cheese, pate & cold meats). Closed on Sundays. 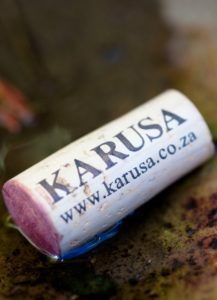 A selection of Karusa wines / beers are available in Gumtree bar. One of the original working farms in Oudtshoorn just off R328 to Mossel Bay. 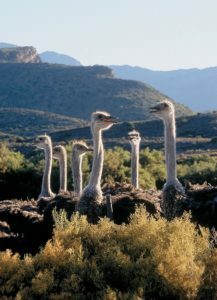 Guided tours are available where you will learn about the Ostrich and its associated industry, feed an ostrich and see their breeding pens up close. Don’t forget to ask for your Discount coupon at Gumtree Guest House. 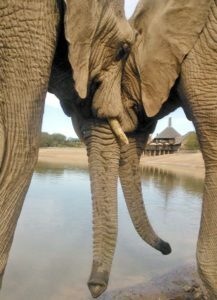 Safari Drive, Horseback safaris, Elephant and Lion Feeding and Meerkat Tours are available. The restaurant overlooks the waterhole which features hippos and other game and is a great lunch or Sundowner-drinks option. Featuring photographs by Roger Young. 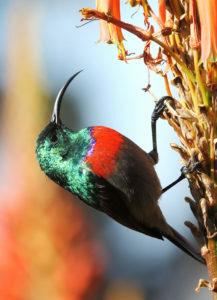 A wonderful stop on a drive through the foothills of the Swartberg between Calitzdorp and the Cango Caves. Interesting photography on display plus a look at Roger’s workshop where he makes furniture. Good coffee and a simple lunch on offer. These tours typically last 2-3 hours starting before dawn. EARLY reservations are essential especially during October thru March. Meerkat Adventures: Guests sit on chairs near the burrows to observe the meerkats as they come out of the burrow into the sunshine and go about their daily routine of foraging and frolicking. These habituated wild animals are never fed or handled by humans. Coffee is provided. 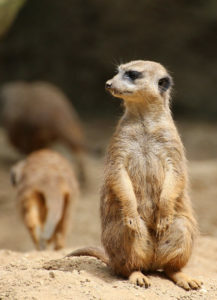 Buffelsdrift: Guests go out in a game-drive vehicle and stay in the vehicle near the Meerkat Burrows to observe the Meerkats. Other animals that might be seen include Giraffe, Zebra, Kudu, Wildebeest, Nyala and Springbok. Coffee also provided. 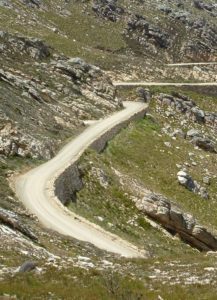 Swartberg Pass is possibly the most spectacular mountain road in South Africa. It was built in the late 1800s and would be considered an engineering feat in the 21st Century. The road is gravel but relatively well graded and is suitable for most rental cars. 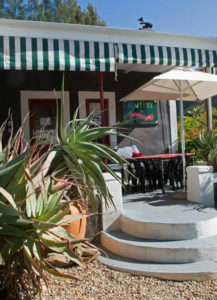 Stop for lunch at the Lazy Lizard in Prince Albert, a picturesque Victorian village in the Great Karoo. Optional visits to an Olive Estate and Dairy for a cheese tasting. Return to Oudtshoorn driving through Meiringspoort, a canyon with sheer rock walls.